The week before Halloween is seriously one of my favorite weeks of the year. Other than the week my kids were born, I live for this week. I love seeing everyone put together costumes and makeup looks. However, I am a bit creepy all year. Many things about Halloween I gracefully add to my wardrobe and life all year. So, while we’re in the spirit, I wanted to share some of my personal favorite shops that sell cute and spooky things all year. Dead Spider Hands: This shop is where that cute mini zine and monster doily came from. The artist that owns this shop’s name is Allie Burke, and she is so incredibly creative. I have a few of her prints in my house, and I always get compliments on how strikingly creepy, yet classy they look on my bookshelf. Her shop is under maintence right now and won’t be up for a few more weeks, but her prints and stickers are so damn adorable. Shop Deer Heart: This shop is a newer discovery, and I love it so much already! This shop sells cute and creepy (and non creepy) pins and other nifty things. That’s actually where the eyeball ring pictured above came from. Worship 13: I know I talk about this shop often, but I truly do love her jewelry and I’ve expereniced nothing but amazing things from her shop. I wear her necklaces very often in my Instagram photos, and these are items she makes all year! I love that I can stay spooky cute all year, and her items are budget friendly. Bella Morta Jewelry: This is another shop I talk about often and mention in my posts, but I do want to include her shop because she will be closing it down soon for personal reasons. I truly love her pieces and I am sad to see her shop go, so I want to share it with you all in case anyone has been wanting anything from my photos. This could be your last chance to snag a few things. Fiend Boutique: This is another newer shop to me, and it should be obvious that I’m a sucker for any shop that sells cute horror themed necklaces and earrings. I’m a huge Misfits fan so the name just speaks to me on another level, but their items are incredible as well and very affordable. Go look at the Jack-O-Lantern earrings right now. Trust me on this one. Pretty Zombie Cosmetics: Okay, would it be a post by me if I didn’t include a few makeup shops? I love Pretty Zombie’s lipsticks, and I have talked about them so often before. Their packaging is so adorable though and it has pretty zombie pin up girls on them. Vanity worthy. Need I say more? My Pretty Zombie Cosmetics: To clarify, this brand is different from Pretty Zombie. This shop sells eyeshadows, and they are incredible! Remember my Halloween tutorial where I used an eyeshadow called “Murder?” That came from this shop. She sells a lot of really awesome quality shadows for $5 each that have the most badass names. 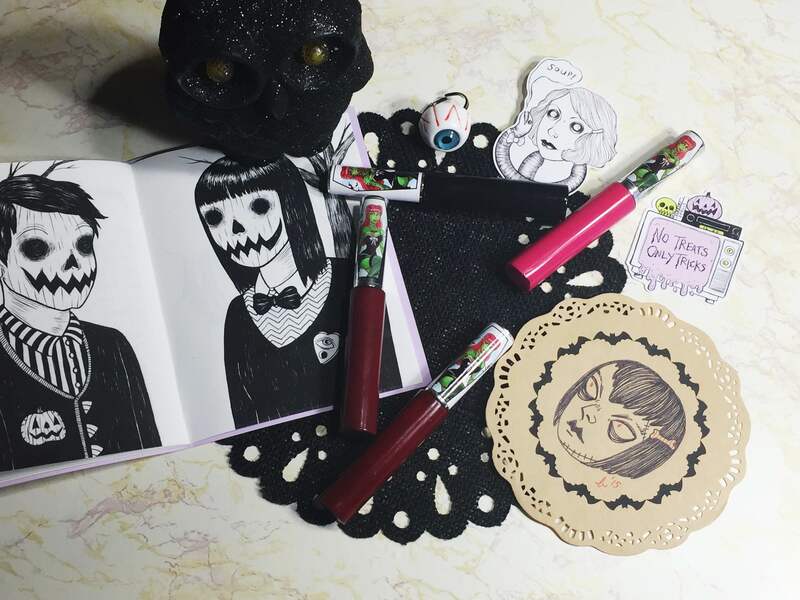 Notoriously Morbid Cosmetics: This shop is probably the newest to me out of all of these, and I’m already head over heels in makeup love. Sharie from Secondhand Sweetness is always talking about them, so I decided to give their mystic matte lipsticks a try, and I was instantly hooked. Their products are vegan and cruelty free, and many are themed. I missed out on the Vincent Price collection, but I did snag the Down the Spiral (also a huge Nine Inch Nails fan, surprise) collection that I will be doing an unboxing for as soon as it arrives. I have high hopes for this brand! Salem Couture: This shop sells mostly Peter Pan style collars that can be worn with any shirt you have! I love this concept, and I own a few myself that I have used in previous posts. They sell many designs, some spooky and some plain. The mermaid one is one of my personal favorites, and I also own the floral one. They have an instagram page as well and they have discount codes pretty frequently! That’s it for today’s short little link fest. I know this is not my usual type of post, but I do use a lot of accessories for my looks and tutorials, and I like to share the love. Indie brands and independent artists are always going to have a place in my heart, and I want so many of them to succeed. There’s a lot of talented artists in this post, so make sure to click the links and shop around in your spare time!